The new generation tennis lovers in India only know Sania's cute face and smashing forehands. Once a while they do read about Mahesh Bhupathi and Leander Paes winning some doubles championship in some part of the world. A little more of interest will yield them the Bopanna-Qureshi (Indo-Pak Peace Express) team which defy all the odds to play in various championships. But there was a definiteive era when Lee-Hesh (Leander Paes and Mahesh Bhupathi aka Indian Express and thats not the newspaper ) pragmatically ruled the world. They were a solid combination with Mahesh's deep serves and Leander's cracking volleys. As kids we wake up early morning to see them play sometimes in mute to avoid the hindi commentary. Newspapers, Magazines, Interviews anything and everything had Lee-Hesh all over it. But during these periods Leander had a comparatively better Singles record as well. A big percentage of Indian sports enthusiasts are aware about his 'bronze medal' victory in Atlanta Olympics (though I personally was much happier for Agassi who won the Gold). But there was a memorable victory of Leander against Goran Ivanisevic in Davis Cup which still gives me goosebumps as I type this. Ivanisevic can be unpredicatble and clearly the heat in India was taking its toll on him, but Leander gets all the credit and at the first place believing in himself to beat the mighty croat. It was an amazing performance with all heart and tenacity. 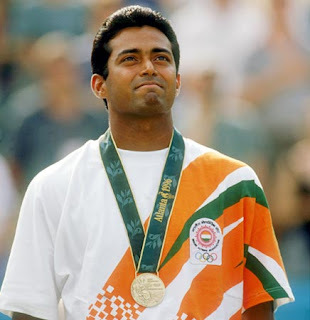 And how many of you know Leander has beaten Pete Sampras (yeah the Pete of old days). Leander playing singles is not breathtaking as his displays in doubles but his game is all about passion and utmost commitment towards his game. And thats why he is the most decorated tennis player of our country.